The worst factory fire in Bangladesh’s history, which broke out on Saturday night in the Ashulia industrial zone, has exposed the ugly workings of global capitalism. At least 112 workers died in the blaze, either through suffocation and burns, or from jumping out of the eight-storey building in a desperate attempt to escape. The fire, which began on the ground floor, where flammable textile and yarn was stored, blocked the stairs. The only other exits were locked. Photographs of the burnt-out Tazreen Fashions building show rows of incinerated workspaces where hundreds of workers produced clothes for major European and American corporations, including Walmart and the C&A retail chain. The lack of elementary fire safety precautions was matched by long hours, poor conditions and low pay. Survivors explained that they were owed three months of unpaid wages, plus bonuses. In the fire’s immediate aftermath, a well-practised cover-up swung into operation at all levels. The government, local and national authorities and employers’ groups shed a few crocodile tears over the deaths, announced sham inquiries and promised pittances in compensation to the families of the victims. All of this is aimed at silencing critics and preventing unrest until the story drops out of the news. At the same time, police, soldiers and the country’s notorious Rapid Action Battalion (RAB) were deployed against distraught and angry relatives at the scene and also protests by workers that erupted on Monday. To justify the security build-up in the industrial zones, Prime Minister Sheikh Hasina Wajed told parliament, without a shred of evidence, that the fire was “pre-planned”—that is, an act of sabotage—directed at destabilising the government. 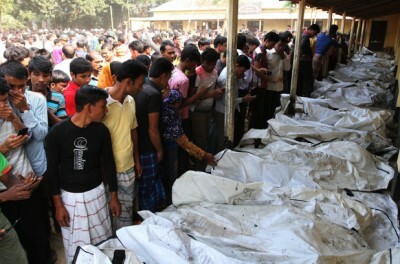 All the global corporations sourcing their goods in Bangladesh have sought to distance themselves from the tragedy. PVH, Nike, Gap, American Eagle Outfitters and the French company Carrefour released statements declaring that their products were not made at the Tazreen garment factory. After its brand labels were found at the scene, Walmart blamed a supplier that subcontracted work to the factory, allegedly without authorisation. In countries like Bangladesh, international corporations, working with trade unions and non-government organisations, have established various inspection systems for safety and working conditions. These supposedly independent audits are a charade designed to protect brand names and profits, and avoid legal liability. The European retailer C&A, which had ordered sweatshirts from Tazreen Fashions, has acknowledged that its so-called mandatory audit simply had not been carried out. None of these giant companies makes the same mistake when it comes to meticulously detailing the manufacture, quality and cost of the items being made in Bangladesh’s sweatshops. They are all well aware that improvements to working conditions, safety standards and poverty-level wages will only lift the price, and so they turn a blind eye. The conditions at the Tazreen Fashions factory were not the exception, but the rule. Saturday’s fire was simply the worst of the blazes that have claimed at least 500 lives since 2006. The garment industry in Bangladesh has expanded over the past three decades to become the second largest in the world, after China, precisely because its wages are the lowest of the cheap labour platforms. A comment in Bangladesh’s Financial Express yesterday detailed the appalling conditions throughout the garment sector: “Only a few owners of garment factories pay the monthly wages and overtime bills to their workers in time… In most factories, the owners deliberately keep at least two months’ salary and overtime bills of the workers in arrears. The management does hiring and firing of workers randomly and the retrenched workers, in most cases, are not paid their dues. Further, in the absence of weekly holidays, the workers, their families and their children are all severely affected both mentally and physically. After providing this devastating picture of capitalist exploitation, the business newspaper lamely concluded with a futile appeal to employers and the government to “fix our apparel sector.” However, the preoccupation of the government, employers and global corporations alike, with the collusion of the unions, is to deflect public criticism and anger in order to ensure that factories remain open and that the profits from the $19 billion a year export industry continue to roll in. Businesses in Bangladesh are in a cutthroat competition with their rivals elsewhere in Asia, Africa and Latin America for orders and profits. The conditions and safety standards facing workers in these countries are no different to those in Bangladesh. In September, the world’s worst factory fire, at Ali Enterprises in Pakistan, took nearly 300 lives, surpassing the death toll of 188 in Thailand’s toy factory fire in 1993. The story in both these cases was the same: no fire exits, blocked stairwells and locked doors, and no existent fire safety measures, forcing workers to jump from windows, in some cases to their death. Once public outrage subsided, it was back to business as usual. Far from conditions and safety standards improving, the worsening global economic crisis is driving companies to cut corners and impose new burdens on workers as corporations struggle to compete. Wages and conditions in the so-called developing economies are becoming the benchmark for the advanced capitalist countries. Already there has been a massive erosion of living standards in the countries at the centre of the European debt crisis—Greece, Spain, Portugal and Italy. Tragedies like the Tazreen Fashions fire will not be halted by appeals to governments and the transnational corporations. The only way to end such crimes is through the unified struggle of workers around the world to put an end to the barbaric profit system and reorganise society on the basis of a planned world socialist economy. This is the revolutionary perspective for which the International Committee of the Fourth International alone fights.